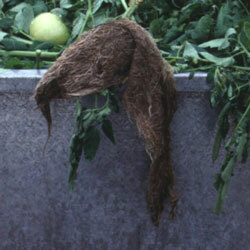 Pythium root rot primarily infects seedlings. It causes seedlings to rot before they even emerge from the soil. Symptoms of the disease include water-soaked, greasy lesions that sometimes form on the stem part and roots after emergence from the seed. You can prevent the disease using sterilized soil or even artificial soil mix for planting seeds. Fuzzy white fungus on potting soil. Seedling stems are rotting away at the base. Newly emerged seedlings collapse at the soil-line. 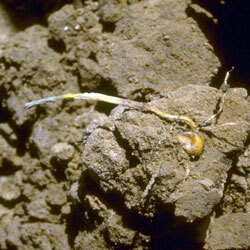 Dug-up seeds are rotted with evidence of fungus. Caused by various soilborne fungi. Leaving covers on planting trays too long. Sowing seeds in warm, humid weather. Start seeds in sterilized soil. A lightweight artificial soil mix like Jiffy-Mix (which is made from sphagnum peat moss and perlite) is safe for starting seeds. Water with aerated compost tea and avoid overwatering. If you want to use regular soil to start seeds, sterilize it first using a pressure cooker at 5 pounds pressure for 20 minutes. A bushel of soil can be disinfected using formaldehyde or formalin. Add 2-1/2 tablespoons to a cup of water and mix it well into the soil. Cover the basket for three days until the formaldehyde smell has dissipated. Disinfect seeds by coating with compounds available at most nurseries. Fungicides can be effective in combination with the preventative methods, but the particular pathogen (fungus) would have to be identified in order to choose the right fungicide.